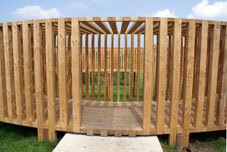 Aeneas Wilder: exhibitions Pit, Art In The Public Space Of Borgloon - Heers, Belgium. Untitled # 158. Douglas Fir, stainless steel, tropical hardwood, concrete. 1700cm x 1700cm x 520cm. This permanent public art installation was the culmination of several years project development between Z33 and Aeneas Wilder. 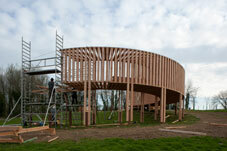 The resulting installation, Untitled # 158, is an architectural construction consisting of a 360° wooden chamber projecting horizontally from the side of a small valley in the province of Limburg. The structure sits close to the hamlet of Kerniel in the proximity of the Klooster van Colen and references the religious heritage of the surrounding area, the historical development of town settlements from the middle ages as well as the natural cycle of this rich agricultural landscape.